I know, I know … why am I finally talking about Rhinebeck and Stitches East in November when they both happened last month? No I’m not nuts! Well … not today anyway. LOLOL! Yes, I think what I have to say about my current shopping style is applicable even after these have past because we all know what’s coming up — yep, holiday sales! More specifically, Black Friday yarn sales! that an increased stash doesn’t mean increased time. I was honest about how much time I have to dedicate to yarn crafting. Although I might plan to do more with new yarn, it’s a waste of finances if I just buy it then let it sit there indefinitely. There are times when that can be done but while I’m working with a budget, plus assessing my current stash, doing so wasn’t such a good idea. All I do is add without actually decreasing the volume if my knitting speed is so much less than my acquisition speed. Trust me … this I know already! The same is true for all those “lemme just get this in case I need it later” or “lemme pick this up. It’s on sale and I always planned to learn, use, do x,y,z” purchases …. you get the drift. not to underestimate my existing stash. My existing stash is large and it is beautiful. Maybe not as beautiful as some, but it’s mine and I love it (except for that gasoline smelling ole skool Red Heart but that’s for another post … 😀 ) There’s always yarn that’s newer, prettier, more hip, more popular. While it’s fine to try stuff from vendors you don’t know sometimes or maybe they might be a vendor everyone loves, ignoring the pretties in your own stash gets one’s purse down to pennies when it doesn’t need to be. Same for other purchases — newer, brighter, shinier, or more popular doesn’t mean better. need vs want. Because I had to work specifically with the $$$ I had on me, I had no choice but to listen to my inner voice. I had to stick to my list, check it twice then really assess what was a need and what was a want. Again, this applies to any type of shopping we need to do. Do I want a new DSLR camera? Heck yeah!!! Do I need a new camera? I could say yes, but without a job, even with my current camera on the fritz, a new camera with additional lenses at a total $600 price tag suddenly doesn’t look so thrifty. I can upgrade later. Right now, it’s all a matter of sound economics. TO LEAVE MY CARD AT HOME!!! Yes, I dared to utter those scandalous, sacrilegious words! Please … don’t slay me. I needed to pull out the big guns to make sure I survived shopping on a budget. The first year I went to Rhinebeck (2012) I went ape bat crazy with the choices! I mean it was overload! I bought yarn I had no clue what I was going to do with (some still not used) and I felt free to use the ATM to take out even more money when I ran out. Nutter!!!! Not you … I mean me. LOLOL! Once I assessed the damage, I realised that I couldn’t continue to shop festivals like that. My friend Sudana didn’t believe I could do it and I can’t say I blame her. The first year after I learned to knit, all I did was shop with the intention to craft and little to none happened while my stash got bigger — see point number 1. LOLOL! What I started doing after that first Rhinebeck experience is to literally start saving my pennies. I put all my loose change in my piggy bank (yes, I still have one) and whatever’s in there from the day after Rhinebeck to the next year’s event, that’s all I’m taking with me. This year, I ended up with $165 in loose change, plus one of the teams at my old job gave me money to buy a Bosworth spindle as a going away present. And that’s all I spent. I got everything in the picture above plus three bottles of wine. Yes! I’m not kidding. 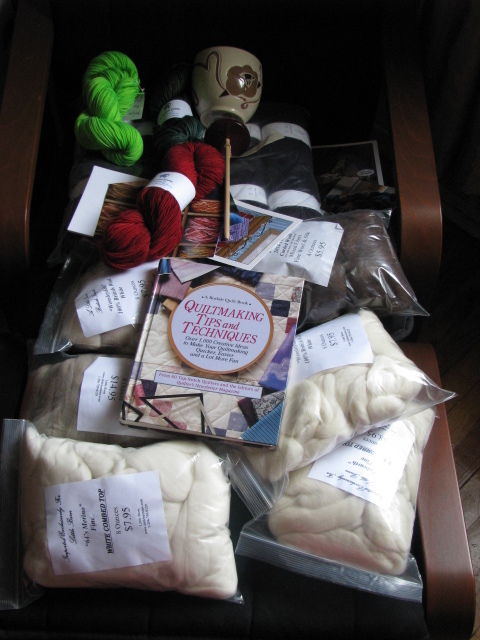 That stash includes a gift for a friend, 6 bags of practice fiber, 2 skeins of yarn for me, a Bosworth midi spindle, 5 greeting cards, a sweater quantity of yarn and because I lucked out big time on the sweater quantity cost, I was able to pick up a yarn bowl and a quilting book. I didn’t go brand name and I didn’t go big, but I got what I needed with $17.00 to spare. It’s amazing how easy every other rule was to follow because I didn’t have the card to fall back on if I over spent. This my friends is how I survived two fiber fairs on a budget and got what I needed at both. Sometimes I feel a little guilty going big sometimes at places like Rhinebeck but that’s also the only time I do any yarn shopping at all. One day I’d like to get my stash down to the point where I had no yarn left prior to yarn shopping. On the other hand, as a knitter to have zero stash would probably be considered a failure, LOL!! Excellent post! I must look back to this when it is time for the next yarn purchase/festival. Smart shopping for hobbies is just as important as smart shopping for all of our other necessities and wants, but we tend to throw those rules out of the window when it comes to our precious fiber. Ya know, I didn’t even think of Black Friday as an event to purchase yarn. But I really don’t need any more added to the stash. I’ve been thinking more and more about the concept of stashing or stockpiling (and over-consumption and frivilous spending). It was once a good thing ( “Look at all dis amazing yarn, y’all *drool*”), but now I’m seeing it as limiting, a bit of a burden, and a guilt trip when I have thoughts of buying a different one to suit my needs. And that part of your comment is right where I’m at now. I’d say the majority of my stash was accumulated the first 2 years after I learned the basic knitting stitches. I wasn’t cranking stuff out, just buying yarn I liked the look of. Fast forward 2 more years, I’ve started to actually knit, be concerned about the fiber I use and of course the fiber I have stockpiled. On the one hand, now that I’m not working, it’s good to be able to go find something without having to buy, but I want to make sweaters, and breathable blankets and those call for fiber and volume I don’t have. And I feel guilty not being able to use what I have already. I’ve gone back and forth about stash knitting exclusively, but I really want to revisit it again. No pressure, just some disciplined crafting. Fantastic post! I’m with you regarding so many points you’ve made especially in this age of over-the-top consumerism. I don’t think I will ever run out of yarn and it’s a shame that I never wear many things that I spend hours knitting (sweaters, I’m looking at you!!). I wish I had half the determination you showed going to TWO fiber festivals and staying on budget. Bravo girl!!!! This is an amazing and inspirational guide to smart purchasing!! The idea to take cash only is such a good one. PS: love your new theme!! As for Black Friday, one year, my aunt, me and my cousin went to see what the hype was about. We didn’t shop that much, we just walked around enjoying the decorations and the like in the mall. We called it quits when while we were waiting to pay for our DVD players, two people started fighting over claim to the last sale toaster. Yikes! We were outta there and never went back. It’s hysterical now but it was great bonding time for us, so I get how special it used to be for you and your mom. I don’t know why something that could have been such a great holiday experience has turned into an extreme sporting event. Yiiiiikes! Yeah, if we had ever seen someone fighting over a toaster, we would have made a hasty retreat. That’s just bonkers! About three years ago, a security guard got crushed to death by shoppers upon opening the gates for them to get in. That’s just crazy to me! There’s nothing in that store that was worth unintentionally killing for. Well well…I need to start hanging out with you more. Excellent post specifically about setting limits on spending. And the age old question we hate to ask ourselves… is it a need vs. want. Great way to use self-control. 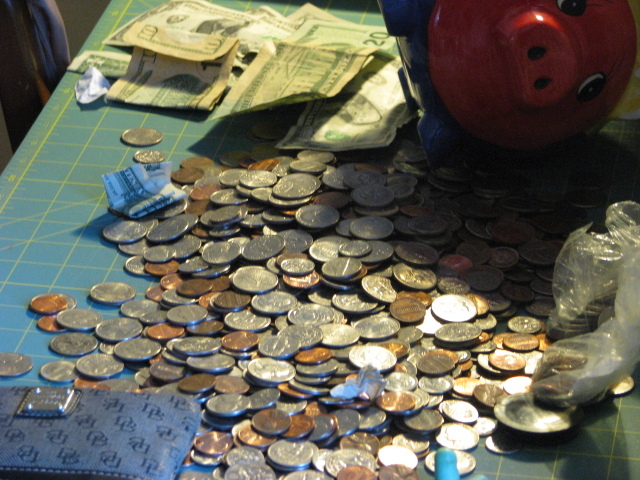 Lastly, great job utilizing the piggy-bank. Thank you so much m’lady! 😀 Looking at my finances differently has really changed my spending habits. I still go ape bat crazy for electronics, books and tea, but even that’s changing. LOLOL! The Public library has saved my life. I can get both e-books and hard copies. The only thing I struggle with is late fees. I love the library and made my monthly trip there yesterday. As much as I love it though, there are times when a bookstore purchase calls my name like a drug. This is an excellent post and a wonderful guide to surviving such festivals. I too finally learned to stop buying craft supplies before I had a use for them but I lament over the money I wasted before coming to haft concept. Now I look at it as a lesson. I am very proud of and inspired by you. It is a lesson. I’m not going to claim to be a martyr of spending, there are things I like and would get because I like them and can afford them. However, reining back has definitely got me focusing in another way — looking forward to the future like buying a house or saving a year’s expenses; things like that have become more important to me especially given my current situation. As for what’s past, leave those things in the past. Now you just focus on being more fiscally responsible which I know you’re committed to already.